hi,i want to know what is the best conversion(marvel vs nelson) unit in accuracy and the advantage of threaded barrel(dont like compensator in 22). is for a future project,the only dont like about nelsons dont ship to PR. The best conversion in accuracy is buying a conversion then chucking the barrel and getting a custom one made. The factory barrels most of the time is good enough for us mortals though. I'm hunting for a Keefer 22 barrel.....don't ever see them for sale though. the Nelson threaded barrel its roughly the length of the marvel no comp. is .24" gonna do anything? Older Marvels that I've tested always shot .6-.7 with cheap stuff. .5-.6 with better. I've been lucky. I had 3-4 Marvel Precision units that I Ransomed 1" at best. Maybe 7/8" with Eley. But I do 10 or more shots. Not the 5 they send out with their units. RWS was always good too. Within my 10 there could be 5 in a row that beat 1". Maybe the middle 5 did it. About the Marvel itself, I have to have the hold open feature. I tried the steel lockback, but the recoil feel was disturbing to me. Now I have 4 Nelsons and one AA. The AA is just as good as the Nelsons, as long as the screwed on stop insert holds up. My present AA has the squarish plate behind the stop. So far real good with it. The first design insert with screws front and back broke twice on me. Jon Eulette wrote: Older Marvels that I've tested always shot .6-.7 with cheap stuff. .5-.6 with better. I've been lucky. I pretty much quit worrying about .22 accuracy. As long as my pistol/ ammo will shoot in the X ring at 50 yards (1.6") I'm a happy camper. I ordered a Marvel threaded barrel about a year ago as a suppressor host. Before they shipped it, they did a 50 yard machine rest test. It groups better than the original barrel that came with the conversion, but both are sub-X ring. Marvel may use a barrel tester rather than a complete gun for testing, but I have no idea. i see one marvel conversion unit with 5 shots in a medallion at 50 yards group .647'' with signum ammo. HSW-52 wrote: i see one marvel conversion unit with 5 shots in a medallion at 50 yards group .647'' with signum ammo. Very few can generate the same target size as the button. Around that time frame. Probably just before. Most people don't use a Ransom correctly The euro factories actually use a machinist vise bolted to a pedestal for resting. When I toured Hammerli in 1994 I actually was able to machine rest a pistol like that. I just did some work on a friends Marvel and just shot it from hand. With cvi sv it was extremely tight and all shots exactly on call. That pistol was a .6 from Marvel. When we first rested it, it shot .5-.6 with various ammunition at 50 yds. I wouldn't hesitate to shoot that pistol in any match. It's that good. John Zurek was regularly in 890's with his Marvel. 1994.... oh man I don't think I had even started grade school. I once had the opportunity to go to the Eley Customer Range with three (3) Hammerli pistols to lot-test TENEX. There were seventeen (17) lots available to test while I was there. I was able to identify for each pistol a lot of ammunition that would shoot forty (40) shot groups at 50 meters of ~0.9 inches. The biggest groups were ~1.5 inches. There was no correlation from lot to lot and pistol to pistol. My conclusion was that every barrel is unique, as is every lot of ammunition, and testing ammunition from a specific lot of ammunition in a specific barrel tells you how that specific lot of ammunition performs in that specific barrel, and not much else. I will repeat my report on a Advantage Arms Ransom test. I could tell the price of the ammo from the group results. Eley did best at 1". AA claims no better than that. Reasonably priced ammo was just over 1"
Cheaper ammo like Armscor was pushing 2"
The real surprise was CCI Green Tag. Green tag grouped 4" and worse. Nothing happened to the Ransom set up. 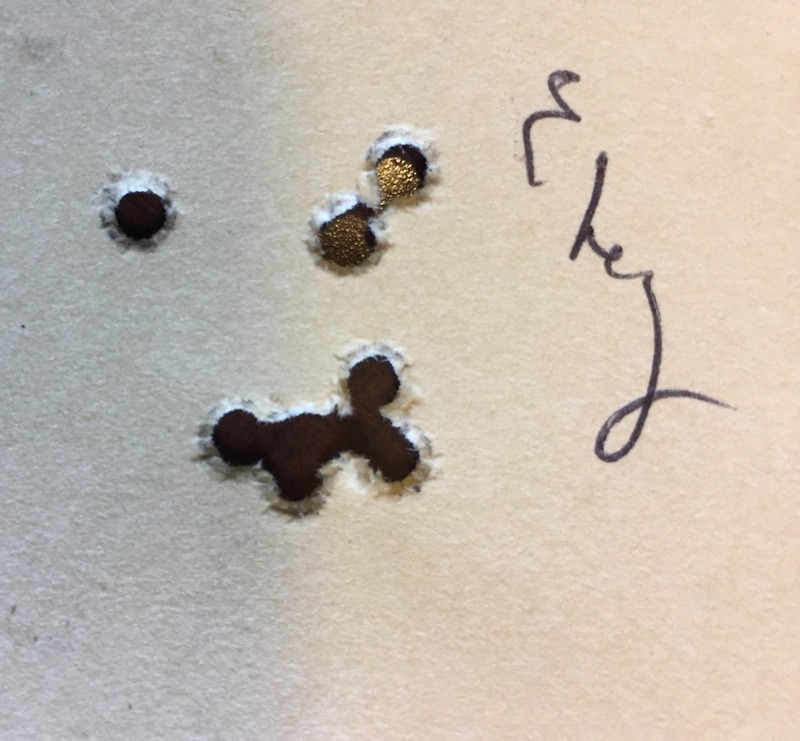 I went back to Eley and shot 1". Shot GT again and got 4"-5". I conclude a bad batch of GT, or the AA just didn't like it. My Ransom set up and work is good as I have this test from my OPA gun. Jack H wrote: I will repeat my report on a Advantage Arms Ransom test. 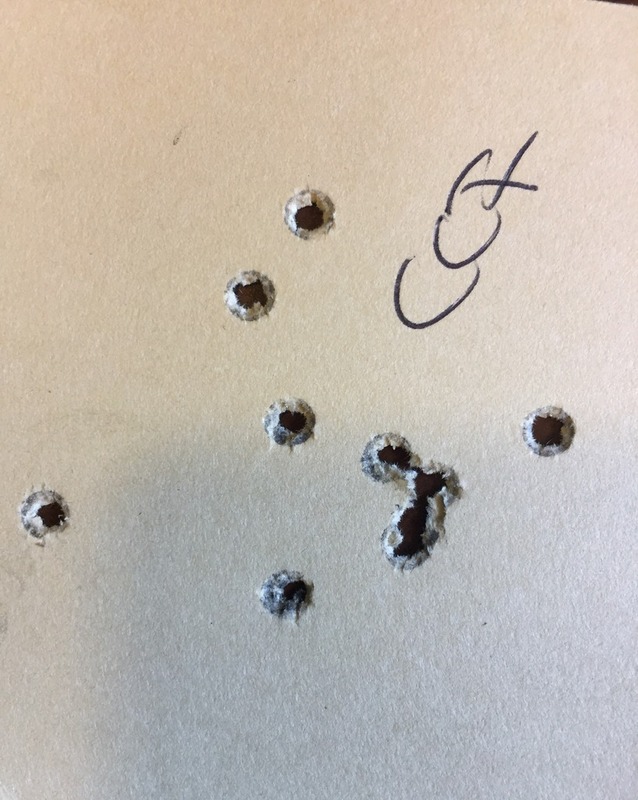 I never got Green Tag to group better than CCI SV, but CCI Pistol Match, well that was another story! I have never had a pistol shoot Green Tag as well as common CCI SV. It was always worse. These Nelson conversion test targets were fired from an H.E.G. rest after the barrel crown was corrected. The groups were about 40% larger prior to that. Unfortunately, this barrel has expensive tastes...lol. Aguila Super Extra not shown, but the group size was even larger than the CCI SV. JayhawkNavy02 wrote: These Nelson conversion test targets were fired from an H.E.G. rest after the barrel crown was corrected. The groups were about 40% larger prior to that. Chris said: "I believe eley match comes off the same machine as the tennex "
Correct; when I visited there were two production lines, white bullet and black bullet. TENEX was what was supposed to come off the white bullet line. After a batch was made it was tested at the QA range. How it performed in their reference barrels determined what label went on the box. It a batch met the TENEX criteria it got a red label. If not, it got another label depending on how far off it was. Is a good deal buy a used marvel conversion? SW-52 wrote: Is a good deal buy a used marvel conversion? With a good price I would say yes, buy a used conversion. Mine is very accurate but it is hard on my elbow to shoot all three 900s with a 1911 grip, angle. jmdavis wrote: With a good price I would say yes, buy a used conversion. Mine is very accurate but it is hard on my elbow to shoot all three 900s with a 1911 grip, angle.